Prepared by Andrew Del Gaizo, MD, Department of Radiology, Emory University School of Medicine, Atlanta, GA, and Bharat Raval, MD, Department of Radiology, The University of Texas at Houston, Houston, TX. 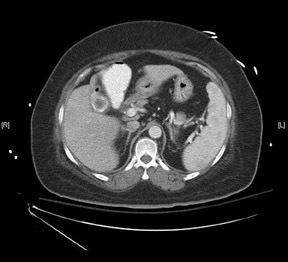 A 65-year-old obese woman presented with severe right-sided abdominal pain, nausea, vomiting, and fever. Her medical history included end-stage renal disease secondary to type 2 diabetes mellitus. The physical examination revealed right-upper-quadrant tenderness but was otherwise unremarkable. On admission, laboratory workup showed a moderately elevated white blood cell count and an elevated alkaline phosphatase. Ultrasound (Figure 1) and computed tomography (CT) (Figure 2) of the abdomen were performed. 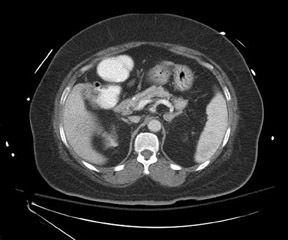 The CT scans confirm the presence of a large calcified intraluminal gallstone, measuring 2.5 cm in diameter (Figure 2). 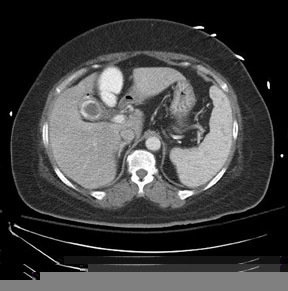 The thin rim of soft tissue surrounding the calcification represents the collapsed gallbladder. In addition, a tortuous, tubular structure containing air and contrast is seen anterior to the gallbladder. The tract extends anterior and inferior, from the gallbladder fossa to the hepatic flexure of the colon, representing a cholecystocolonic fistula. Cholecystocolonic fistulas are a rare condition, comprising <0.2% of all biliary tract disease. 2,3 The typical patient is a woman in the sixth or seventh decade of life with multiple comorbidities. 4-6 The patient often presents with symptoms characteristic of cholecystitis, including right-upper-quadrant pain, nausea, vomiting, and fatty-food intolerance. 4 Therefore, a diagnosis cannot be made on clinical symptoms and laboratory values alone. In patients with biliary-enteric communication to the duodenum, the potential for gallstone ileus exists. 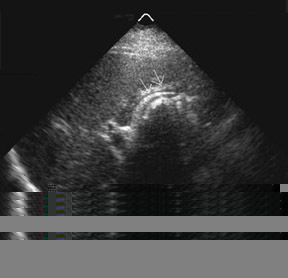 This occurs when a large gallstone (usually >2.5 cm in diameter) becomes lodged at the ileocecal junction. 8 The classic presentation, although seen only in approximately one third of patients, includes small bowel obstruction, visualization of the obstructing stone, and pneumobilia. 6 In patients with biliary-enteric communication to the colon, the potential for impaction at the sigmoid colon, the narrowest portion of the large intestines, exists. 8 Symptoms in these patients include abdominal pain and distention and tend to develop slowly. No obstructing stone was discovered in the patient described in this case. Therefore, either the stone responsible for the fistula is still present in the gallbladder, or the stone responsible was too small to cause obstruction and was passed without notice.